I received this eARC through Edelweiss in exchange for an honest review. During World War II families in England were concerned that their children would be harmed from the frequent Nazi bombings. Families struggled to come up with enough money to send their children to Canada on large ships. Ken is one of the lucky ones, even though he doesn’t feel like it. Ken thinks that his stepmother just wants to be rid of him and continue on with his father and her own child. With no other choice, Ken borders a luxury cruise liner, which will take him to Canada. Aboard, he finds new friends in the other children traveling on their own to their temporary homes. These young passengers are nervous because they have heard of other ships being sunk by the Germans. While the adults promise that their ship is well protected, the boys are still taught how to board the lifeboats. One night, the boat is hit and begins to sink. 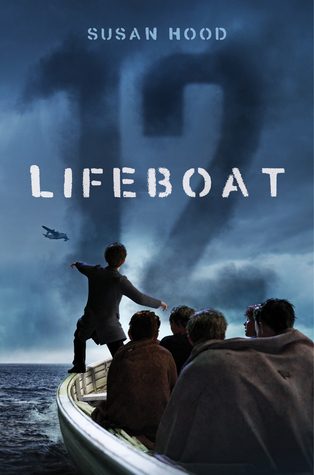 Ken and several others board the last life boat, but their struggle to survive has only just begun. They are lost in the open sea with limited provision. Will they survive long enough to be saved? This novel in verse is based on a true story. The children were fun and funny. This novel explores parts of the war that are not traditionally addressed, especially the loss of lives. It is interesting to see this world of luxury liners, after the sinking of the Titanic and her sister ships. I thought that the novel moved quickly. The characters weren’t as developed, but the pacing of the plot was far more important and did its job effectively.